Rare Window Spotted: Six Over Three Double Hung…One of a Kind! While vacationing in North Carolina, Ann and Laurie ran across this interesting window. It appears to be created from the sashes of two different windows. There was some ingenuity (or luck) involved to make the divided lites of the two sashes match up. Notice how the muntins line up in a 6 over 3 design. The bottom sash was installed up side down, we think inadvertently. How do we know? Look at the closed window. The bottom rail is buried behind the window sill. The thicker rail should be at the bottom. 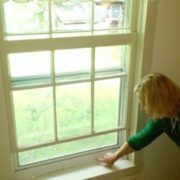 As if this window wasn’t interesting enough, the storm window that was added for additional energy efficiency, we’re guessing, was too small for the window. 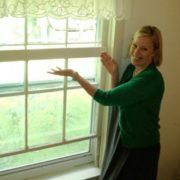 Ann is pointing out in the last picture where the window sill was built up a couple inches to accommodate the opening. Built in 1911, it is only fitting that this charming farmhouse would have windows with the same amount of character. Just like Masons admire unique stone work and teachers are stopped by typos, we revel in the uniqueness of windows and doors. If you have an unusual window or door, post it on our Facebook page. We would love to see it! https://doorstoreandwindows.com/wp-content/uploads/2012/07/Lesson-2-15.jpg 315 560 admin https://doorstoreandwindows.com/wp-content/uploads/2017/11/Transparency-Logo-2-300x181.png admin2012-07-23 20:03:112018-06-15 20:14:52Rare Window Spotted: Six Over Three Double Hung...One of a Kind! 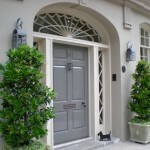 We found this excellent blog post by Maria Killam on the “Ten Best Front Door Colours for your House.” Really unique color ideas for front doors – along with great pictures. After all, it’s only paint! Every Friday – bright and early – the installation team meets to talk about next week’s work. Why? Because we want our customers to have a great experience. We review each job and the details that will make your project a success. We talk about any problems so we can take corrective actions. 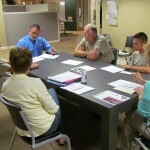 The team also discusses safety concerns, material and equipment needs, and housekeeping/maintenance projects. The last agenda item – so we end on a positive note – everyone describes a personal or job success. This usually results in a couple of laughs and some lighthearted teasing. We’re biased but we think we have the greatest installation team in the city! By far – the very best.